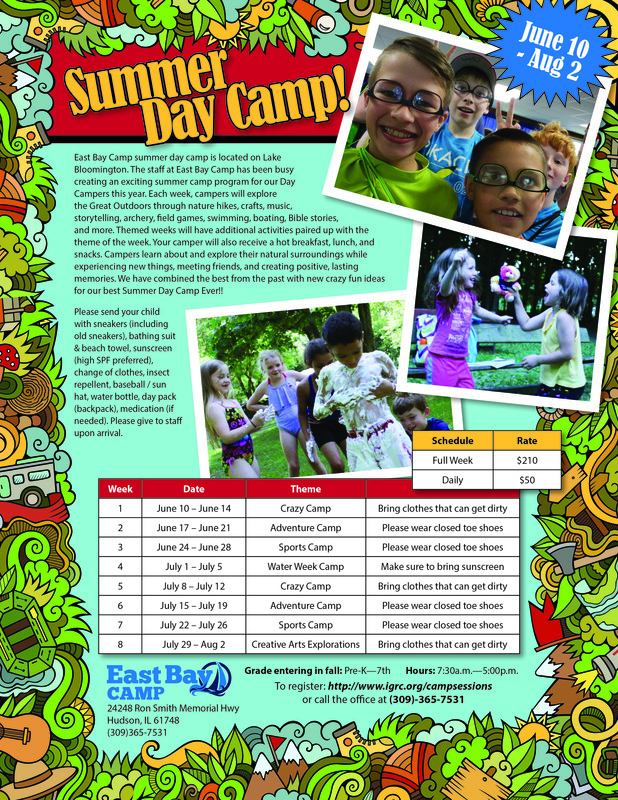 Download the Summer Day Camp Flyer here. East Bay Camp offers a day camp experience for children ages Pre-K to 7th grade, an appealing option for families in the Bloomington-Normal, IL, area. Campers may be dropped off as early as 7:30 a.m. and stay until 5:00 p.m. They may enroll for a single week, multiple weeks, or for a whole summer of fun. Day campers enjoy many of the same adventures other campers do: swimming, boating, field games, crafts, music, storytelling, archery, nature hikes, Bible stories, and more. They explore their natural surroundings, make new friends, and create positive, lasting memories. A new theme each week makes each session unique. The day camp registration fee includes a hot breakfast, lunch, and snacks.